Visualizing high-order finite element simulation data using current visualization tools has many challenges: discontinuities at element boundaries, interpolating artifacts, and evaluating derived quantities. These challenges have been addressed by postprocessing the simulation data using the L-SIAC filter. However, the time required to postprocess using this filter needs to be addressed to enable using it on large datasets. In this work, we introduce an efficient technique to speed-up the L-SIAC filter and alternate ways to gain further speed-up at the cost of accuracy. This method is also ideal to postprocess at regularly spaced locations, which would be suitable for standard visualization software. 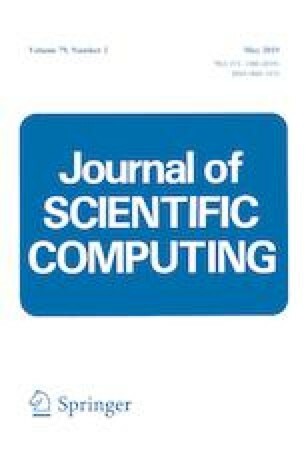 Our results show that our method can achieve up to two orders of magnitude speed-up as compared to our interpretation of the technique presented in Docampo-Sánchez (SIAM J Sci Comput 39(5):A2179–A2200, 2017). The authors wish to thank Professor Spencer Sherwin (Imperial College London, UK), and the Nektar++  Group for helpful discussions. We also acknowledge Mr. Bob Haimes (MIT), which whom our collaborations on visualization motived this work. The authors acknowledge support from ARO W911NF-15-1-0222 (Program Manager Dr. Mike Coyle).